I made these cookies and now I'm having to hide them so there will be a few left for the master of the house when he gets home from hunting. Several days ago I planted seeds and each day, like a child waiting for Christmas I look into the propagator and come away disappointed. Nothing to see yet, so I'm drumming my fingers and chewing my nails and waiting, waiting some more for something to start. 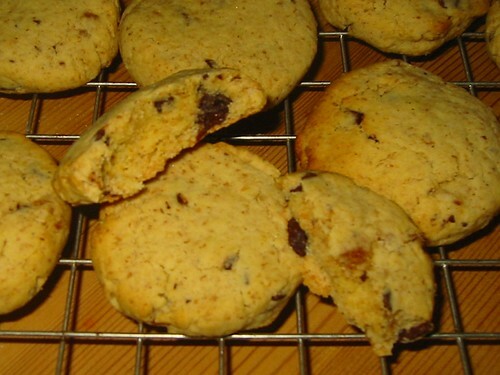 Mmmmm, chocolate chip orange cookies. Don't make them too thick or they'll be chewy rather than crunchy. This is a clever way of making a permanent bed with a wood based core. I tried leaving a comment but don't know if it registered or not. The Throwback at Trapper Creek has the polytunnels I desire. I'm intrigued by the hugelkulture post. I'd love to see one in person. A few years ago, I made a straw bale garden, similar idea of raised bed built on organic matter that is slowly composting. It was fun, but definitely only a 1-season bed.